Alright troops. I don’t often carry event listing these days seeing as how I rarely leave the house and tend to forget there is a larger world out there, and I rarely stray far from Glasgow when I do but, seeing as there has been a wee bit of Sheffield – Glasgow traffic over the years I thought I’d get this one out there. 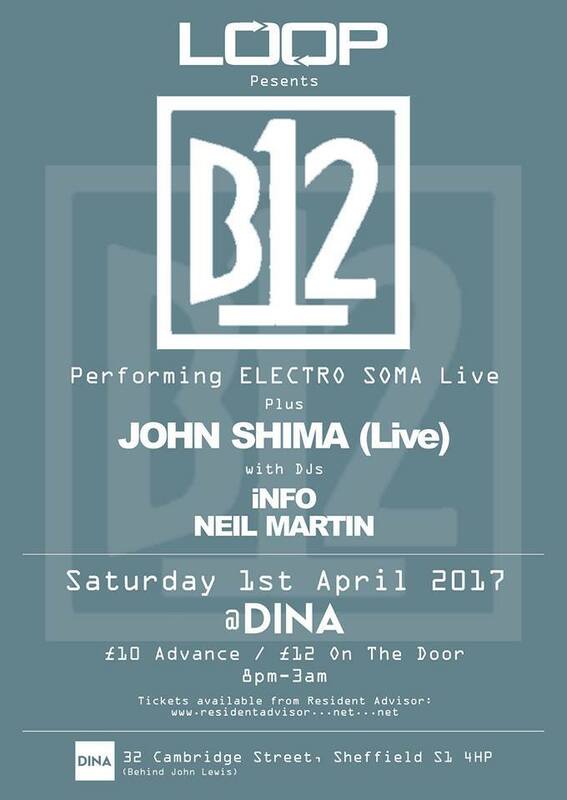 It’s not the Weegie connection which is important here, but the chance to hear legendary techno and electronica outfit B12 playing their seminal album Electro Soma in a live environment. Released on Warp in 1993, Electro Soma remains a seminal moment in both early British techno and the burgeoning IDM scene. Even after all these years it’s more than still up there with the likes of Autechre’s Amber, and Black Dog’s Spanners, and is still a high water mark on Warp’s catalogue. Time to get reacquainted and get yourself down. It’s a true stunner. Also on duty is John Shima who we’ve covered here once or twice and is currently out there as part of the Emerald City EP on Verdant along side Plant 43, Leigh Dickson, and Mihail P. The boy’s a good ‘un, and his deep, travelling, Detroit influenced sound should be a great counterpoint to B12’s cosmic explorations. Support from local jocks Info And Neil Martin rounds off what looks like a proper treat of a night. Converge on Dina @ 32 Cambridge Street, Sheffield S1 4HP (handily behind Lewis’) on Saturday night for the answer to all your techno dreams. Early kick aff at 8pm through to 3AM. Tickets a ten spot in advance or 12 on the door, But I’d get them early. I can’t see many being left behind for this one. Advance tickets can be had from HERE so get on it before it’s too late. Lovely. 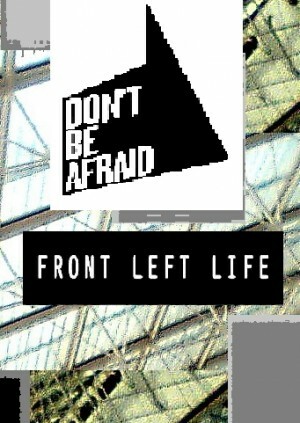 Don’t Be Afraid has emerged in the last couple of years, alongside the likes of Hessle Audio, Numbers, Berceuse Heroique and Livity Sound, as one of a handful of contemporary labels to continue in the grand British electronic tradition of refusing to allow themselves to be pigeon-holed into one particular sound. Seemingly never happier than when they’re mixing things up, they’ve recently brought us a pair of excellent DJ Bone 12″s (under his Differ-ent guise), some morphic experimentalism from the always exciting Herva, and the brilliant debut album from Detroit alumnus Mgun amongst plenty of other quality moments. And we’ve got label head Semtek right here to share some of his favourite clubbing memories ahead of the label’s May-day party with the Front Left Life collective. The DBA-FLL party on May Day will, in the best traditions of the London party scene, be held at a secret location which will only be revealed to ticket holders on the day of the event. Get involved in the mystery right now for a ten spot. For booking and more information check out their FB page right here , then head over here to get your grubby little hands on one of the fast dwindling tickets. Ok, folks, It’s over to Semtek! 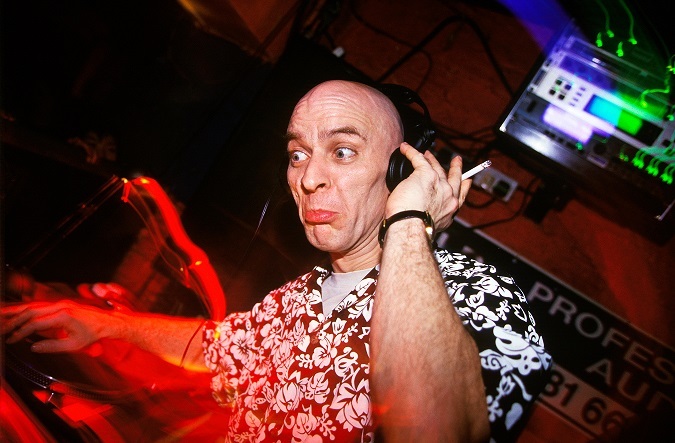 Keb Darge DJing at Bar Rumba nightclub London. We had heard of Bar Rumba from visiting record shops in Soho like Fat Cat and Mr. Bongo, and one Bank Holiday during the summer of 1996 we found ourselves there after a long day wandering around the Notting Hill Carnival. It so happened that at the time Gilles Peterson was running his popular Monday night session. James Lavelle was playing a mixture of ambient drum & bass and instrumental hip hop and there was practically nobody there. I recall trying to hide my jacket behind the chairs by the dancefloor because we didn’t know what a cloakroom was. It attracted some odd looks. We didn’t drink anything at the expensive bar and we didn’t need to – at that age the experience was so new to us that the pure adrenaline was plenty to keep us dancing. It was the first time I heard Peshay – The Real Thing which appeared on Headz 2. We signed DJ Bone as Differ-Ent during 2014 and shortly afterwards it was announced he was touring the UK, with a major date at Fabric for the Hessle Audio night its centerpiece. Fabric has experienced a mix of press over the years but, despite the inevitable drawbacks of its superclub status, it would be impossible to write any history of London nightlife without mentioning it. The Hessle Audio Friday night at Fabric was an adventurous residency, and frequently you would find them sharing a bill with drum and bass promotions like Metalheadz. It was a happy mixture of UK music free from the limitations of the club’s Saturday night programming. I recall turning up on the night and wandering into the Metalheadz room where Om Unit was playing Capone – Paradise, a personal favourite from the Hardleaders label, before proceeding to the main arena where Levon Vincent’s Impressions Of A Rainstorm was dropping. Bone’s set had been pushed back to 4am in order that the club could be drained of those perhaps less interested in the music than in the drinking, and the effect was that by the time he played it really did feel like a room full of friends with Bone at the controls cutting between his own Latin-tinged brand of techno and the classic sound of Detroit. 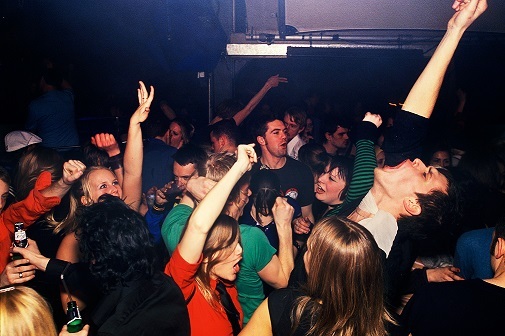 I recall emerging into the sunlight with Clerkenwell silent and brooding on a Saturday, reflecting that however hard anybody tries, the experience of spending the night out dancing to techno in the center of London will never quite be matched. People talk about Metalheadz as being some sort of musical education but that’s an exaggeration. It was just a really good party with great music in the type of venue which East London used to be well-known for. At the time Hoxton Square was effectively a beacon of cultural activity in an otherwise dead area. There were a few record labels on Curtain Road, such as Pacific Records, and there was an excellent cinema on the square itself but otherwise it was a wasteland. We had been regulars at Metalheadz throughout the later part of ‘96 and the early part of ’97 so much that we knew the door and bar staff by name. Goldie’s innovation was attracting a young hip London crowd to drum n bass who had been put off by more lively but also more dangerous events like Roast. Given the choice I would give up having been to Metalheadz entirely to have gone once to Roast or AWOL at the Paradise but we were too young at the time they were active. The thick smoke and sweat dripping off the ceiling on the last night meant that you couldn’t really tell who was playing but I recall Watching Windows (Gnarly Mix) almost demolishing the place whilst Mark and Clayton from TOV / Renegade Hardware stood by the decks discussing business as if none of it was happening. At some point in the mid-noughties a group of enterprising young types decided that it would be a good idea to throw a party on the river Thames during low tide in front of the South Bank Centre. It’s odd to think that this was ever possible as in today’s climate of conservative fear and mistrust a party like this would probably end up on the front of the Daily Mail. The premise of the party was that a bar and soundsystem would be set up as the tide went out and the dancefloor would expand outwards, then as the tide came back in the dancefloor would recede with the speakers and bar eventually being hoisted back onto dry land. Miraculously nobody ever died at any of these parties but that wasn’t for want of trying: on this occasion we decided it would be fun to climb up inside Waterloo bridge using a crate to make our way from the edge of the water to the bottom of a service ladder which extends down one of the near struts. We succeeded in reaching the top of the strut where we were able to turn on and off the lights inside the bridge – something approaching but perhaps not achieving total control of London and its infrastructure. Needless to say we spent far too long doing this and failed to anticipate the fast receding tide and our diminishing sobriety. Even this near death experience does not redeem the fact Mylo – Drop The Pressure was playing when we returned to dry land, but sometimes the least important aspect of a party is the music. As dubstep was emerging between 2003 and 2009, the sound of house and techno became notably awful with both minimal and electro having been wrung-dry for ideas by unscrupulous producers. It was easy at that time to forget that 4/4 music had ever sounded any good, despite some of the more interesting noises that were starting to come out of Detroit and Leipzig. When The End announced it was closing few were surprised, with London’s recession economy surviving solely on the ongoing buoyancy of the property market. In a way though, this presented a unique opportunity to look back on the best of the noughties and simultaneously exorcise some of its musical demons. Laurent Garnier headlined the final night with the bill otherwise filled by residents like Mr. C, and Layo & Bushwacka. I had never seen Garnier play and what I had heard about his sets – that he played jazzy jungle sometimes alongside French electronic classics – hadn’t predisposed me to him but on the night itself it was the perfect reminder of why dance music is great. I recall a bunch of hardened Essex gangsters handing out pills to the crowd whilst The Chase played out at 10am on the Sunday morning with Danny Rampling going crazy on the dancefloor next to us. Although he did eventually ruin the whole thing by playing half an hour of DJ Marky tunes, it also felt like a timely nod to the importance of d’n’b for the venue so all is forgiven. 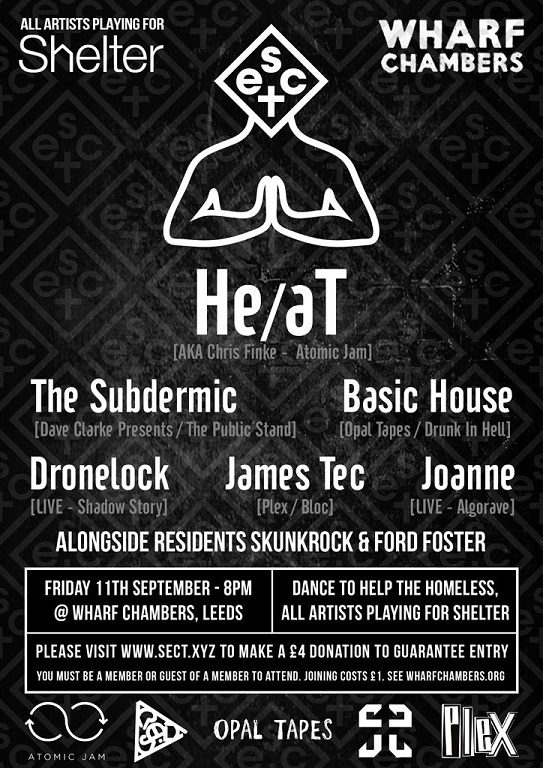 Event: Sect: – Raising Money For Shelter UK, Wharf Chambers, Leeds. Friday, 11th September. I don’t tend to do much coverage of nights outside of Glasgow in these irregular sections, but I’m breaking with tradition this time because I’ve mentioned on several occasions that I think house and techno has often been a little hesitant (or outright reluctant) in supporting worthwhile causes – with a few obvious (perhaps predictable) exceptions – so when a club actually steps up to do just that I think it’s worth passing on the information. And there are few better causes at the moment than Shelter, the charity who offer advice, help and support for those facing housing and homelessness problems, and who campaign to tackle the root causes of these issues. They do great work, especially in the face of a government which increasingly cares little for anyone who isn’t one of their gang. Northern institution Sect have put together a belter of a night featuring DJ sets from James Tec, Opal Tapes founder Basic House, The Subdermic, and HE/AT, plus live sets from Dronelock and Joanne. Club residents Skunkrock and Ford Foster provide the foundation for an evening of twisted, banging and quite possibly utterly mental electronic abuse and warped techno all inside the safe haven of the Wharf Chambers – a former pork pie factory now running as a workers co-op which provides a space for many community activities. A former pork pie factory. How brilliant is that? To secure a place on the guestlist, please visit our website http://www.sect.xyz for all the details. We’re asking for a minimum donation of £4 which is an absolute bargain for a line-up like this, so please feel welcome to donate more – every penny donated goes directly to Shelter via the social charity platform, Givey. Wharf Chambers Co-operative Club is a members’ club, and you need to be a member, or a guest of a member, in order to attend. To join, please visit wharfchambers.org. Membership costs £1 and requires a minimum of 48 hours to take effect. 4 quid folks. 4 quid for all that mad quality. That probably wouldn’t buy you a minging Vodka Redbull at your usual handbags-and-pouting glamour pit these days let alone get you through the door. So get your arses down there on Friday and shake them raw in aid of a very, very good cause. 8 until 5, at the Wharf Chambers, 23-25 Wharf Street, Leeds, LS2 7EQ. Yes folks, part two of a Friday night double header comes courtesy of my old Alma Mater, Mystex, ambling back from the misty great beyond like some weird funky shade with a clutch of burning tunes in one hand and an empty bottle of Buckfast in the other. 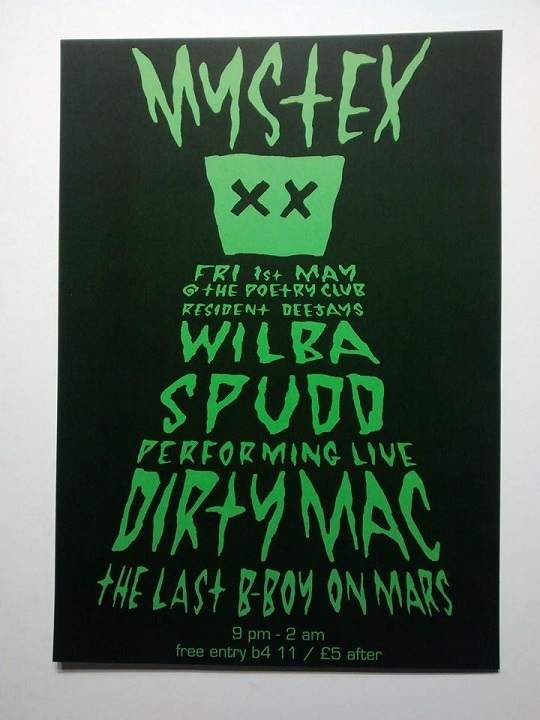 Wilba and Spud provide the smiles and the vibe in support of a live set by Dirty Mac, the last B-Boy on Mars – a set which Mystex guarantee will be a special experience. If the past is any indication of the future, expect dirty nasty beats and a wallop of twisted grooves. Doors open at 9PM down at The Poetry Club at 100 Eastvale Place, Glasgow G3, with free entry before 11, but only a very sweet fiver after. Dress casual and dance like you mean it. Never thought I’d be writing up a listing for Mystex. It’s like a grinning Lazarus in dirty Converse. Excellent. That’s two full on nights this Friday. You’ll get a special award if you make it to both. 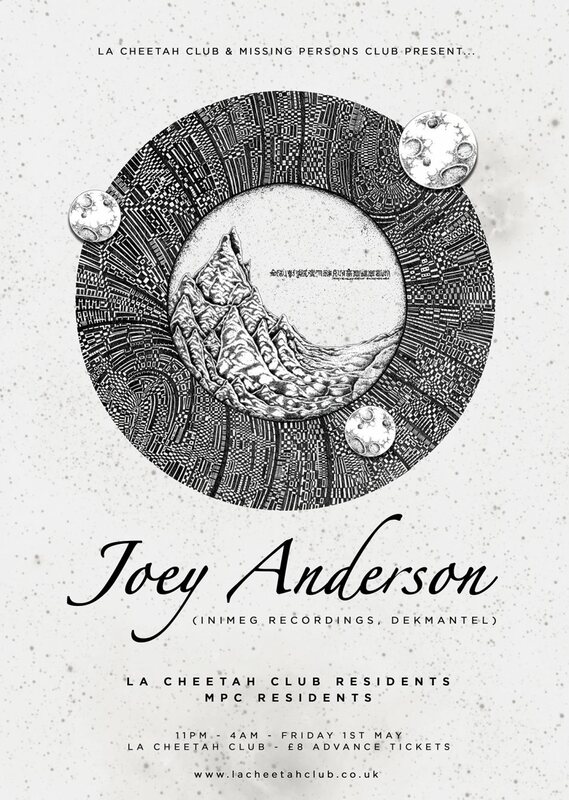 Missing Persons Club have had more than their fair share of quality guests over the last couple of years, and this Friday they’re on their way to topping the lot when they and La Cheetah join forces to bring the one and only Joey Anderson north of the border for his Glasgow début. The US producer has consistently been on bang up form for a while now, and hit new heights with last year’s ‘After Forever’ LP for Dekmantel, one of my albums of 2015 and a record that took deep house and techno, and reworked them into something quite special. I’ve got to tell you, I don’t know what to expect, but if his now legendary set at last year’s Dekmantel festival in Amsterdam is any indication it’s probably best to go prepared for galactic whirlpools of space-age funk and deadly silicon based grooves. Support from La Cheetah and MPC residents. Doors open at 11 down at Max’s La Cheetah on Queen Street, and those good (well, on this occasion) folk fae the council have bestowed a 4AM licence on the proceedings, meaning you get an extra hour of drenching yourselves in sweat and getting mad with it – for free! Tickets are a bargain at £8, available in advance from Resident Advisor. I imagine it is going to be mobbed, big time, so do yourself a favour and get down there early enough to physically fit into the place. Probably also a good idea to not have to work on the Saturday and then leave it too late to take the day off. Like an utter fanny would. You’d think I’d know by now.